Online booking has been closed, In case of any ticket related enquiry please contact to the organizer. Navaratri is round the corner! For all Dandiya and Garba enthusiasts, the man with the magical voice Atul Purohit, is on his 10th tour to Australia. He will entertain audiences in Brisbane on 27th August along with his famous Rutambara Group. Unpack your traditional attire – Colorful Ghaghra-Choli & Kurta-Pyjama before you become a part of the evening that awaits you. Get ready for another simply mind blowing performance at the 11 Hamish Street Calamvale QLD 4116, 6:30 pm onwards. Gates will open at 6 pm for the 6:30 pm start. Please be there early to avoid unnecessary rush. Premier Tickets is Australia’s leading online event ticketing & marketing solution provider. We act as a channel between the event organizers and end customers helping our clients with hassle free event ticket booking, event marketing & promotion solutions. 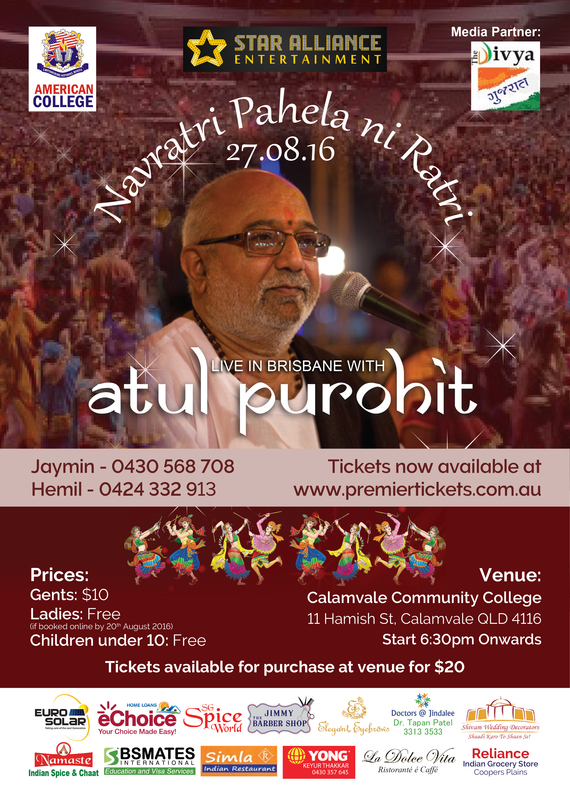 Contact us for any of your ticketing & marketing needs for Atul Purohit LIVE – Navratra Mela Brisbane 2016.